Mothers California Gold Car Wash - 32 oz. Mothers California Gold Car Wash was created with a careful balance of powerful cleaning and exacting care. You can wash your car thoroughly while protecting your wax. It's not just about bubbles-various dishwashing liquids and soaps can harm your wax. Mothers California Gold Car Wash is strong enough to remove dirt and road film, bugs, bird droppings, airborne pollutants and other grime, without removing wax or dulling the paint. Mothers' pH balanced, super-sudsy cleaner also resists water spotting. Mothers All Wheel Cleaner - 24 oz. 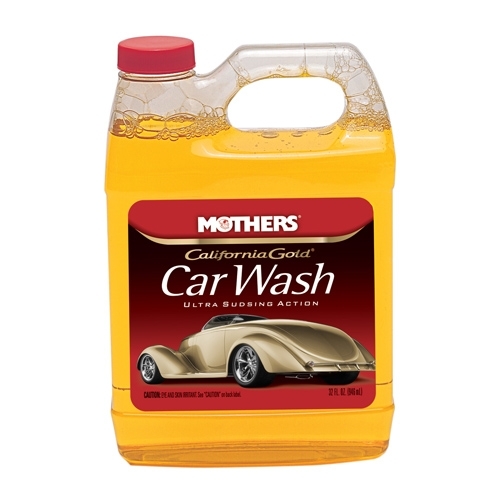 Mothers California Gold Car Wash - 64 oz.